What’s the difference between a Dodge and a Mercedes Sprinter van? None, aside from the badging, yet many people believe there are differences and assume that Mercedes Sprinters are obviously higher quality than Dodge Sprinters. Not long ago Justin and I were hanging out at a park with the van and ended up giving a tour to some people who realized it was converted and come up to chat. One of the gals explained that she intended to convert a Sprinter too, but was saving up for a Mercedes one, not a Dodge like ours. We didn’t bother saying anything but have been surprised how often people express that sentiment. Here’s the deal: in 1998 Daimler-Benz merged with Chrysler Corporation to form DaimlerChrysler AG for a number of reasons and as such, sold Sprinters under under the Dodge moniker from 2003 until 2007 when Daimler sold Chrysler and became Daimler AG. The production of Dodge Sprinters was stopped two years later. Throughout this time, all Sprinters were manufactured in Germany and then had their drivetrains and fuel systems removed before being shipped to the United States and reassembled in South Carolina. This meant that it could then be sold under Dodge and therefore avoid the 25% light truck import tariff. The outcome is that anyone with a Dodge Sprinter, like us, will notice that everything in and on the vehicle, aside from badging on the steering wheel, back doors, and grille, is branded with the Mercedes symbol. So, for those of you who are interested in swapping your Dodge grille for a Mercedes one, here’s a little how to. We purchased our grille conversion kit complete with original Mercedes-Benz parts from Europarts, one of our go to sources for Sprinter stuff. P.S. I wrote this, so don’t blame Justin for mistakes in terms etc. Remove the top portion of your grille. 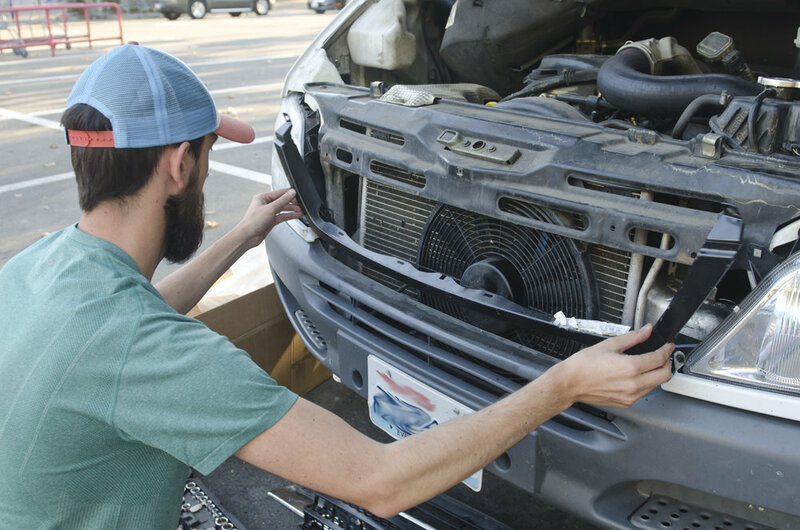 The top part of our grille was stuck on with a strong adhesive, so we used a heat gun and a plastic scraper to coax it off. We plugged an extension cord into an outlet in the van to power the heat gun and it worked beautifully. When we first discussed doing this switch, we thought we’d also have to also switch the hood for a Mercedes branded one that had the rounded cutout for the Mercedes symbol, but come to find out, all Sprinter hoods already have the cutout. Ours was just hidden by the top of the grille. Remove all the adhesive residue left behind, otherwise it shows when the new grille goes on. We used Goof Off adhesive remover/Goo Gone paired with plastic scrapers and towels and it still took us about an hour to get it all off. Towards the end, we realized that you have to just keep constantly soaking everything with the adhesive remover and kind of scrape it off in layers. As in spray the adhesive residue, make one run over it with your scraper and towel, spray it again, one more run over it and so on. Get our your socket wrench and remove all the bolts/plastic push fasteners holding the grille in place. Ours had just one bold in the center and two plastic push fasteners on either side that Justin was able to pry loose using a screw driver. Attach the new grille. Ours came in two parts: the edging that Justin is holding up in the photo below, and the actual grille part with the symbol. At first we thought they attached separately but realized that would make the symbol sit too high, preventing it from fitting in the cutout on the hood. Justin quickly figured out that the two pieces snapped together and when we held it up as one piece, everything fit perfectly. Getting it attached was as simple as re-fastening the center bolt and pounding the push fasteners back into place. Our new grille had two extra attachment points than our old grille that lined up with pre-drilled holes. We were able to put a screw through the one on the right side, but the plastic part that would have had the pre-drilled hole on the left side was broken off by someone, so we just zip tied that side to the frame. Enjoy your new grille! As you can see, switching grilles is a pretty straight forward process that’s quick aside from scraping off all the adhesive residue.